This entry was posted in biomedicine, Sci&TechStudies(STS), WhysToLookForGenes and tagged genetic variation, race, Rosenberg, Sesardic, Wade on April 9, 2016 by Peter J. Taylor. A recent post finished by wondering how we reconcile the figures for within-population variation versus among populations against the 2-dimensional PCA (principal component analysis) of Li et al. (2008), http://www.sciencemag.org/content/319/5866/1100.full In Li et al’s analysis, 89% of variation is within populations, 2% is among populations, within groups, and 9% is among groups. What such variation means is that it is difficult, on the basis of a random selection of genetic loci, to assign an individual to one branch of the tree of human ancestry or the other. However, the PCA plots (such as the one below) make it look like within groups variation is somewhat less than among groups variation. 2. 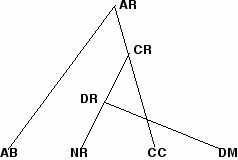 Consider, as a thought experiment, groups separated on the first axis. 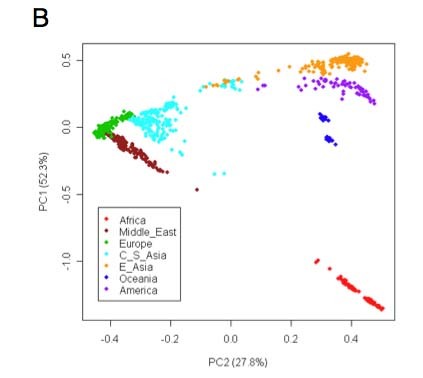 That is, 3 subdivisions of human genetic diversity — African (red); Europe + Middle East + most Central/South Asia + Oceania (all in one group, brown, green, light blue, and deep blue); and E Asia + America + some CS Asia (gold, purple). Then choose some place on the second PC as if the variation in that direction were all the variation not accounted for by the grouping (rather than actually only 3/5 of it). There’s a lot of overlap among the three groups for any position with PC2 > 0.2. This shows how a randomly selected gene (or combination of genes) not captured by the first axis won’t be a reliable basis for separating groups; members of two or more groups will share that gene. 3. Now consider groups separated by using both PC axes and imagine choosing a gene (or combination of genes) along the direction of the remaining variation (20% of the total). Again, a randomly selected gene (or combination of genes) not captured by the first two axes won’t be a reliable basis for separating groups; members of two or more groups will share that gene. 4. Granted, a randomly selected gene (or combination of genes) captured by the first two axes will do OK in separating groups. However, if the trait we are concerned with involves many genes (not to mention environmental factors interacting over a developmental sequence), we will expect it to be difficult to link differences between any two individuals in different groups to genetic differences. 5. Of course, IF the genes that do allow us to separate groups (either in an ancestry method or using PCA) had been the focus of natural selection in divergent environments, then the separation on the ancestry tree or PCA plot would mean something. Is there any evidence for that? Indeed, what would be required to establish evidence for that? This entry was posted in biomedicine and tagged genetic variation, Li, race on April 29, 2011 by Peter J. Taylor. 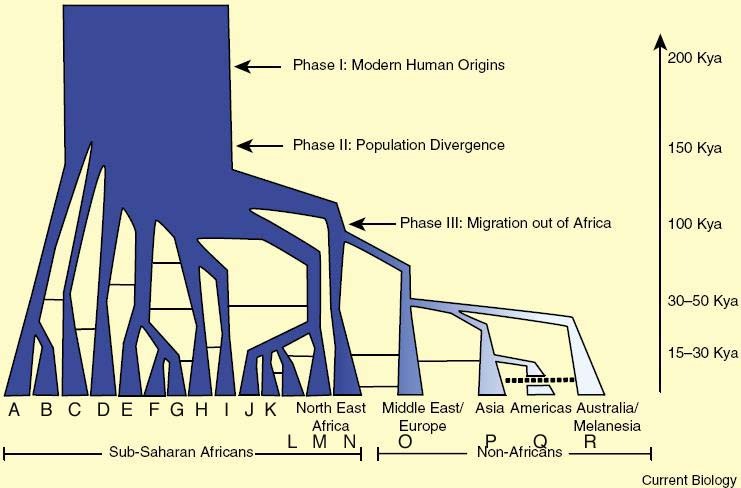 If, instead, we divided human genetic variation according to branching distance from the external reference population (namely, chimpanzees) and asked for 7 groups, they would be San, Mbuti Pygmies, Biaka Pygmies, Bantu, Mandenka, Yoruba, and the rest of the human population in the world all put together. (Is this right? The assumption here is that time since diverging from a common ancestor is, in molecular clock fashion, reflected in overall genetic divergence.) That would give us a colored belt with 6 narrow bands of color on the left and one solid band stretching out the rest of the way to the right with a few stripelets from the six African groups appearing in that solid band. Now someone could sample more in the African groups and produce a tree that, say, splits the San the Mbuti Pygmies, and the Biaka Pygmies and then, to make the 7th group, lumps the the rest of the human population in the world all put together. Or someone could sample fewer African groups and end up with, say, three African groups, Mozabite, Bedouin, Palestinians, and the rest of the human population in the world all put together in the 7 human groups. This sensitivity to sampling leads to the question: Is there a basis for subdivision that isn’t susceptible to who is sampled more or less and doesn’t depend on color coding that mostly defines the groups before doing the analysis? Perhaps the PCA in figure S3B is what’s needed—it uses the full set of information about genetic variation in a sample of 900+ individuals to spread the sampled populations across two dimensions. That diagram suggests (to my eye) 4 subdivisions of human genetic diversity — African (red), Europe + Middle East + Central/South Asia (all in one group, brown, green, and light blue), E Asia + America + some CS Asia (gold, purple), Oceania (deep blue). Does that bring us back to Africans as one race, albeit with Europeans subsumed in a large mix? That is, does it undermine a reading of the Campbell-Tishkoff diagram that suggests that, if there were 4 races, 3 would be African and one would be African plus the rest of the world put together? At the same time, keep in mind is that, in Li et al’s analysis, 89% of variation is within populations, 2% is among populations, within groups, and 9% is among groups. (This affirms results dating back to Lewontin 1972, but affirmed by subsequent work, such as Hofer et al. 2008, that, on average, for any genetic locus roughly 5/6 of the variation is within a population, 1/12 is within a region, and only 1/12 occurs among regions.) What such variation means is that it is difficult, on the basis of a random selection of genetic loci, to assign an individual to one branch or the other. We need to say difficult, not impossible; merely subject to more errors than to correct assignments. The question I have (and plan to email the authors to see if they can help) is why this isn’t evident in the PCA plots. Those plots make it look like within groups variation is somewhat less than among groups variation. Perhaps this is because the PCA uses many loci and, contra what I just said above, a combination of a random selection of loci does allow us to discriminate among something like the classical groups? (Remember, however, that people of recent mixed ancestry tend to be eliminated as subjects in these studies.) Perhaps it is because the PCA is biased towards the particular loci that allow us to trace ancestry. Obviously, I need to understand more about what the methods are doing. Hofer, T. et al. (2009) Large Allele Frequency Differences between Human Continental Groups are more Likely to have Occurred by Drift During range Expansions than by Selection, Annals of Human Genetics 73 (1): 95–108. Lewontin, R. C. (1972) The apportionment of human diversity. Evolutionary Biology 6, 381–398. This entry was posted in biomedicine and tagged genetic variation, Li, race on April 21, 2011 by Peter J. Taylor. 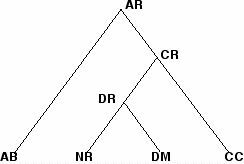 Below we see the tree for the first three forks, where AR is short for a group that includes all the ancestors of groups A through R; NR for all the ancestors of groups N through R; etc. 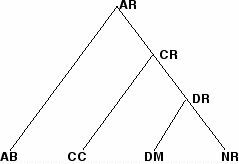 Now, the branches at any fork can be flipped so the next diagram conveys the same information about ancestry and branching. 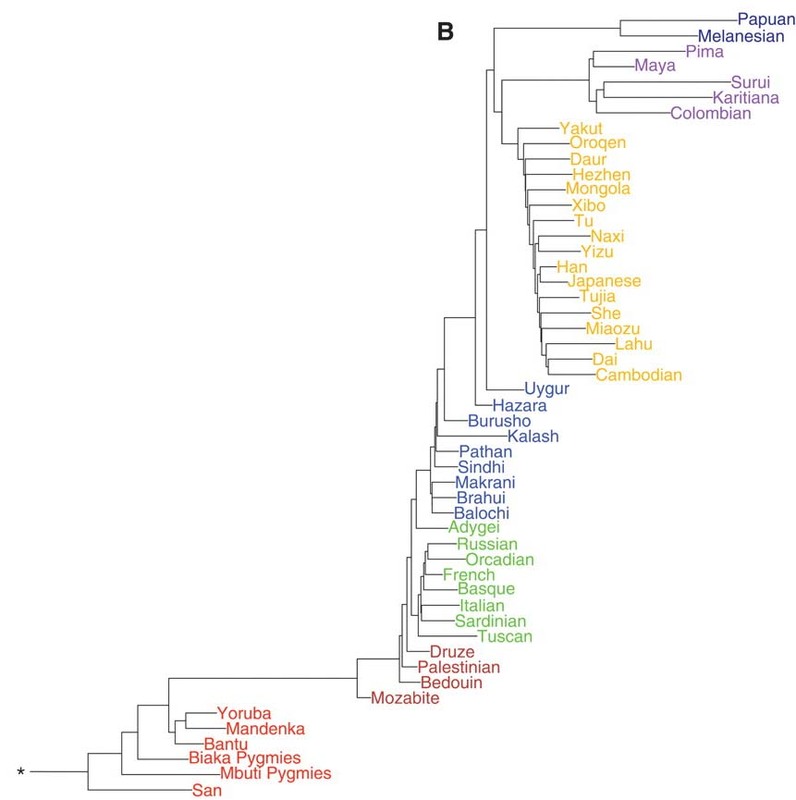 Notice that the second variant does not convey the impression that the branch that in ancestral to the non-Africans, i.e., NR, is more different from the branches ancestral to the African groups, i.e., AB, CC, DM, than these branches are from each other. Although the lineage that ended up at CC (the ancestor of group C) branched off earlier than the lineage leading to NR, there is nothing in the ancestry diagram that says it should be more similar genetically to AB than to NR. It is not easy, however, to convince one’s brain not to give significance to these horizontal positions. This cognitive weakness gives rise to the explorations in the next posts. This entry was posted in biomedicine and tagged ancestry, diagrams, genetic variation, human on March 24, 2011 by Peter J. Taylor. Sceptico (stands up): Time Out. What are you doing — standing behind a podium and lecturing? This is a BioQuest workshop — the audience should be involved in Posing the problem, Problem-solving, and Persuading others of the value of their approach. Jokero (pops up and calls out from the back): Oh, that’s what the 3Ps are — I thought it was Perform to Provoke. Sceptico: That’s only two Ps. GivItAGo (moving in front of the lectern): OK, let’s give this a try. We have prepared a script and we want to perform it. But, after we’ve run through it once, let’s start again and allow the audience to question what we say and suggest alternatives. G: Today we’re going to explore the teaching of race to biology students. S: Why teach about race? — don’t you aspire to a race blind society? G: I do want a prejudice-free society, but we’re not nearly there yet. Race is still very important in US society, whether or not people think it should be. Turning a blind eye to it is not going to make discrimination go away. S: OK, but still I don’t think you should teach race in a biology class. It sends the message that race is based in the facts of biology. Look at the history of biology being used to justify exploitation of one social group by another, and often to justify the extermination of the subordinant group. G: Good point, Sceptico. Let’s put “facts about biology” and “race and historical case studies” on the list of things we should teach about biology and race. S: History in a biology class!? S: Are you proposing that there are facts that stand for themselves? S: I don’t think the distinction factual vs. conceptual is very helpful for thinking about how to teach this material. This entry was posted in biomedicine, Sci&TechStudies(STS) and tagged biology, genetic variation, race on March 4, 2011 by Peter J. Taylor.